A country cottage apartment for 1-2 residents, located 4 minutes to Shoal Bay East Beach. Designed with the amenities to be a comfortable home, Bonnie & Isaiah’s country cottage apartment is an ideal place for 1-2 independent people to stay for an extended visit to the beautiful island of Anguilla. Here, you will be a quick 4-10 minute drive (2 routes) to gorgeous Shoal Bay East Beach while being situated in the relaxing near-shore countryside…also a perfect location for a ‘working vacation’. While staying at the cottage apartment, residents would be welcome to use the exercise and spa facilities at any of the resorts on the island for a modest fee charged by the resort. All resort bars, restaurants & beaches also welcome visitors staying on the island. You do not need to be a guest at a resort to enjoy the beach and swim in the sea at that resort. 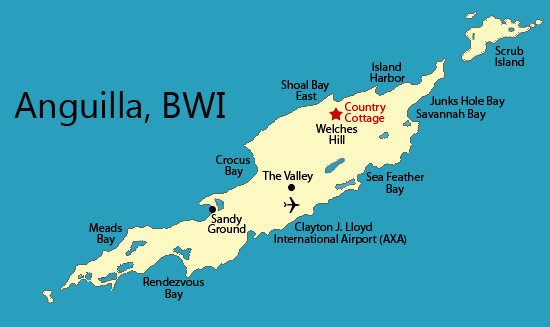 Since Anguilla is just around 35 square miles (91 square kilometers) in size, while at the cottage apartment, you won’t be far from any of the island’s best restaurants, spas or any of its 33 beaches – all open to the public.